Before I start this piece I would like to add, that as with all food, taste and preferences are subjective, the following descriptions are purely my opinion based on years of sampling product both good and bad. Let’s start by saying what a burger is not. A burger is not any of the following: Mushroom – Vegetable – Tofu, Turkey, Sausage Chicken or any other meat but BEEF. Whilst these items are delicious in their own right in a sandwich or main meal, they are not and never should be classed as Burgers. 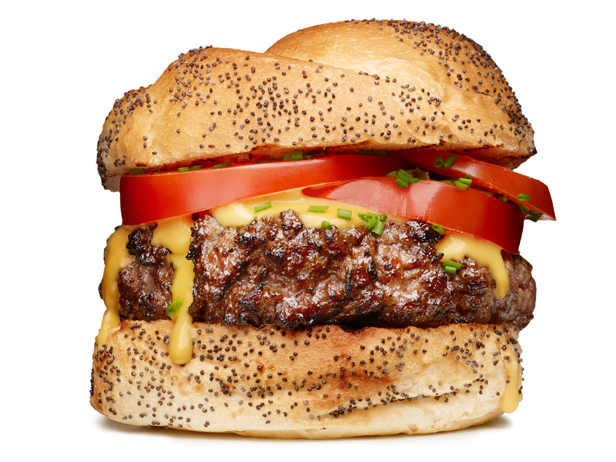 The Meat: A burger should be made from a combination of tasty beef cuts, for example, short rib, brisket and chuck with an approximate 80% to 20% lean to fat ratio, but tastes and cuts will vary. They key fact is that an all lean burger will be too dry, and too much fat content will be greasy, unappetizing and fall apart. The weight should be a minimum of 8oz (Ideally 10oz) and a single patty no double or triple patties. The meat should be ground as near to cooking time as possible to avoid contamination from bacteria on the outside of the meat. Food Safety Note – Bacteria from the animal is often present on the outside of a piece of steak, and when subjected to intense heat such as a BBQ or grill the heat kills the majority of the bacteria, hence being able to have a rare steak without too much risk of bacterial food poisoning. When you grind the steak you are essentially moving any bacteria from the outside of the meat and combining it throughout the burger. The grill will kill most of the bacteria on the outside of the burger, but if any exist on the inside they will be unaffected by low cooking temperatures and could make you seriously ill. The longer the dwell time in undesirable temperatures the higher the risk. It goes without saying that restaurants should make sure they handle the meat safely. Keep the meat refrigerated until ready to cook and keep work surfaces clean and sanitized. They must also ensure that staff always wash their hands before and after handling the ground beef. According to the USDA, the minimum safe core temperature for ground meat is 160° F (71° C). It is particularly important to cook ground meat to a safe temperature for children or the elderly as they are the most likely to be seriously affected by a foodborne illness. The Cook: It’s all about the sear! – Now that the food hygiene is out of the way, we can move on to the most delicate part of the process, cooking. A burger should be cooked preferably on a “Flat Top” but a Grill or cast iron Skillet will do the job just as well as long as you can maintain a high heat to the cook surface. The heat should be enough to “Sear” the beef and obtain a crust like appearance and slightly charred to the outside of the patty whilst retaining a succulent juicy center. No burger should be contemplated unless you can choose the meat temperature, my favorite is medium rare and given the caveats as above I believe well worth the risk as millions of American burger eaters will attest to. A well done burger in my opinion is a waste of money, the fat content has been burnt off and the result is a dry brick of meat and a disappointing meal. The burger just like a good steak should have had time to rest and allow all those great juices to be absorbed back into the meat. The Bun: Quite simply a Brioche bun large enough in circumference to accommodate both the burger and the toppings, toasted on one side. The Toppings: All the classics as below apply here but toppings such as Foie Gras, Caviar or Peanut Butter although beloved at burger competitions have no place here. Lettuce: Fresh crispy Romaine or Iceberg lettuce. Tomato: A firm tomato large enough that a slice will cover most of the burger. A fried egg “Sunnyside Up, atop the burger has become one of my “Go to” favorite toppings but can understand those of you who disagree. Whether you agree with my preferences or not, what is clear that according to The Economist, an average American eats 150 burgers a year. So at an average of 3 burgers per week it would be a crime not to have a clear and personal preparation of one of America’s favorite foods.